We are extremely excited with the installation of the latest VISX Star 4 ActiveTrak excimer laser system. The STAR 4 ActiveTrak System, which incorporates a unique 3-D eye-tracker, delivers improved laser vision correction. As the name implies, ActiveTrak actively tracks the patient’s eye and guides the laser. ActiveTrak moves the laser with the eye, keeping the laser and the patient’s pupil precisely aligned during the quick procedure. This feature along with ActiveTrak’s ability to customize laser vision correction for each individual patient, gives us even more confidence about the expected out-come of laser vision correction. The STAR 4 has a broad range of indication and approvals, and is appropriate for myopic, hyperopic, an astigmatic treatments. The STAR 4 upgrade also positions the VISX laser for wave front technology that is now installed. The VISX Star 4 is permanently installed at the location where treatments are performed. 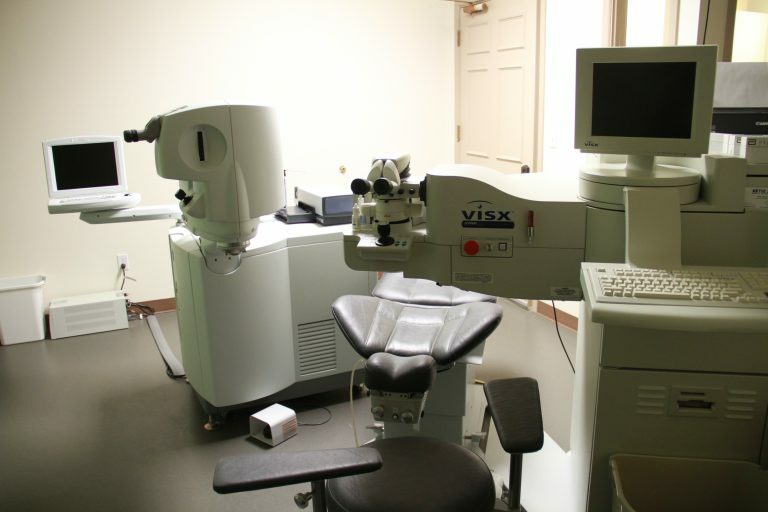 Eye LASIK Midland has designated a special room for this highly sophisticated instrument. The laser suite features separate cooling, power supply and flooring that meet strict laser requirements. The use of a permanently installed laser reduces the possibility of errors that may occur with portable systems. Call us today to learn more about these amazing technology.